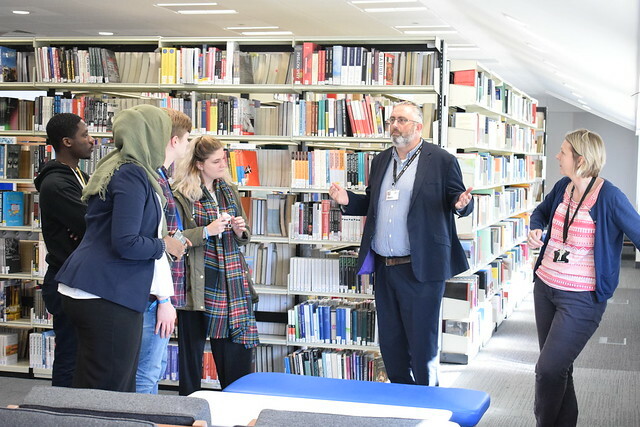 The penultimate stage of the library’s £6.2 million development project has been delivered with the opening of a new-look space on the first floor. Contractors have been working through the night to deliver the modern mixed-use space in time for the new term. The new space adds five group study rooms fitted with TVs, whiteboards, projectors and charging stations to the library’s offering. Additionally, there are two rooms that will have the twin purpose of acting as a teaching room for study skills and research skills training by the library team and as drop in PC suites when teaching is not taking place, as well as a large open space that blends books with PCs. Zamzam Ibrahim, President of the Students’ Union, is delighted with the various learning opportunities that the library now provides. The space is not built solely for study though as there are a number of comfortable seats, benches and diner booths for students to sit back and relax. Sue Hoskins, Library Development Project Client Lead, is delighted that the new-look space has been delivered in time for the new term. The Library Development Project, which will bring 250 additional study spaces, 75 additional PCs, eight new individual study rooms, nine group study rooms, improved lighting and much more, will complete with the opening of the refurbished ground floor early next year. You can see the work that is currently happening on the ground floor in the video below.